Devoted to the Promulgation of Truth, the Healing of the Sick and the Instruction of All Who Desire to Learn Self-Mastery. Nevada, MO. Publisher: Weltmer School of Healing. Editor: Sidney A. Weltmer; S.W. Weltmer, first assistant. 24 pp., fifty cents. Illustrated. 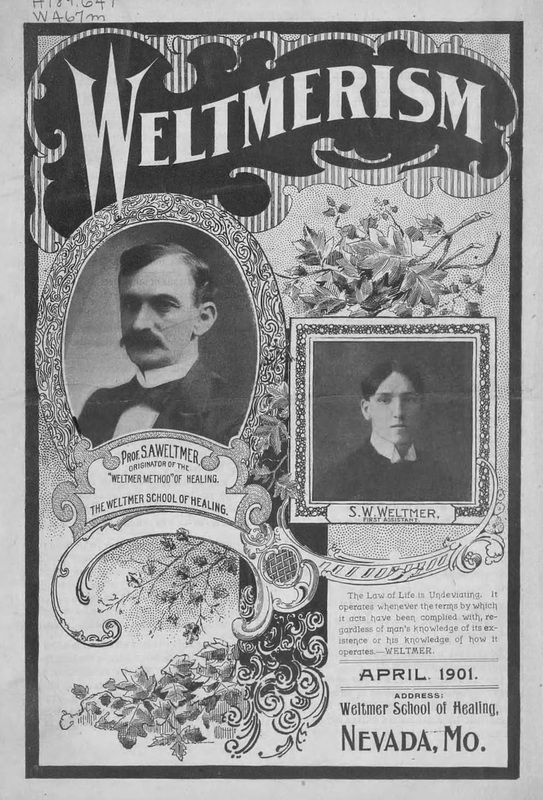 This was one of the advertising vehicles for Sidney A. Weltmer’s psychic healing courses and sanitarium, filled with glad testimonials from satisfied patients, advertisements for courses, and glowing biographies of the Weltmer School of Healing. On Weltmer, see the note under Weltmer’s Magazine. The issue of April 1901 is in the Weltmer paper at the State Historical Society of Missouri.